The Treaty of Fez on 30 March 1912 established the French Protectorate at Morocco, and one month later General Lyautey was appointed Resident General of the country with which he was very familiar. In 1907, Lyautey had already successfully tested the armoured vehicle designed by Captain Genty from a 1904 Panhard. After this was destroyed in an accident, other manufacturers such as Clément-Bayard were invited to replace it. Illustration of the armoured car carrying General Lyautey to Marrakesh. But their models could not survive the stresses of the terrain. In 1911, the Command asked Panhard for 3 "Genty" armoured cars (24 hp, 1200 kg, top speed 70 km/h). Panhard set to work urgently and in less than 3 weeks the first car was delivered, demonstrating the adaptability of the manufacturer and highly praised by the War Minister Adolphe Messimy. 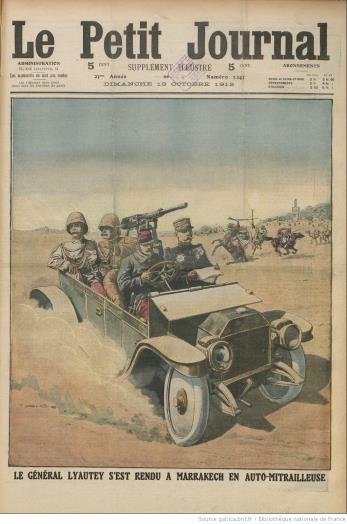 In Morocco, the armoured car transported and escorted the authorities through the country, as the Petit Journal describes: "He made the entire journey in an armoured car under the astonished gaze of the knights of the desert". An impressive vehicle, this was known locally as the "Mahboula", which means "the mad one" or "the spirited one".